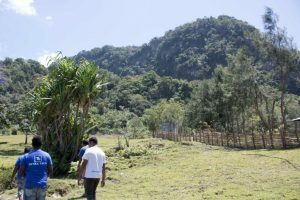 Recently I went on a week-long fieldtrip to a mountainous area of Timor Leste called Ossu, in Viqueque district. The town of Ossu lies at the feet of the Mundo Perdido (Lost World) mountain peak, and looking out of my window from our cosy accommodation in the local nunnery at the mist floating over the rocky jungle it wasn’t hard to see where it got its name from. Apparently it was a stronghold of the resistance independence fighters, which is also easy to understand. The reason for our visit is that Willoughby Friends of Ossu, a group of generous Sydney-siders, are funding one of WaterAid’s local partner organisations to undertake the rehabilitation of the water supply in this area, and we were there to check the progress to date. This area is notoriously difficult when it comes to their water supply – in the past it was classified as urban due to relatively high population density, meaning the government was responsible for the operation and maintenance of the system. It is now designated as rural, meaning the community has to manage their own system – and as you can imagine this has caused some issues. As a result, there have been multiple attempts at rehabilitating the water supply in the past decade, but they consistently failed because they were purely infrastructure projects, without community engagement. This time the partnership of organisations is determined to do things differently, and implement a sustainable solution. 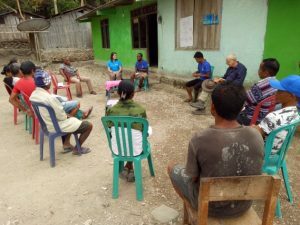 The first step was to set up a GMF (water user group), which is a group of (volunteer) community members in charge of the management of the water system, including collecting tariffs and operation and maintenance activities. On our first day in Ossu we had a chance to meet the GMF, and discuss their thoughts on the system. They seemed motivated and dedicated, and keen to receive training on topics such as sanitation, hygiene, financial management and operation and maintenance. It was interesting to finally see a group like this in action, after reading so much about them during my studies. We spent the rest of the week in Ossu looking at the progress of the work, and working out what to recommend as a possible second stage of the project – there are many houses downstream from this new system (relying on a different spring) still only receiving water once or twice a week. I really enjoyed my week seeing some work in the field and experiencing just how important it is to provide ‘software’ (community groups, training etc) alongside the ‘hardware’ (water systems). WILLOUGHBY FRIENDS OF OSSU INC.